Froese, born in Tilsit, East Prussia, in 1944, was little influenced by music while growing up. Instead, he looked to the Dadaist and Surrealist art movements for inspiration, as well as literary figures such as Gertrude Stein, Henry Miller, and Walt Whitman. He organized multimedia events at the residence of Salvador Dali in Spain during the mid-'60s and began to entertain the notion of combining his artistic and literary influences with music; Froese played in a musical combo called the Ones, which recorded just one single before dissolving in 1967. The first lineup of Tangerine Dream formed later that year, with Froese on guitar, bassist Kurt Herkenberg, drummer Lanse Hapshash, flutist Volker Hombach and vocalist Charlie Prince. The quintet aligned itself with contemporary American acid rock (the Grateful Dead, Jefferson Airplane), and played around Berlin at various student events. The lineup lasted only two years, and by 1969 Froese had recruited wind player Conrad Schnitzler and drummer Klaus Schulze. One of the trio's early rehearsals, not originally intended for release, became the first Tangerine Dream LP when Germany's Ohr Records issued Electronic Meditation in June 1970. The LP was a playground for obtuse music-making -- keyboards, several standard instruments, and a variety of household objects were recorded and filtered through several effects processors, creating a sparse, experimentalist atmosphere. Both Schulze and Schnitzler left for solo careers later in 1970, and Froese replaced them the following year with drummer Christopher Franke and organist Steve Schroeder. When Schroeder left a year later, Tangerine Dream gained its most stable lineup core when organist Peter Baumann joined the fold. The trio of Froese, Franke, and Baumann would continue until Baumann's departure in 1977, and even then, Froese and Franke would compose the spine of the group for an additional decade. On 1971's Alpha Centauri and the following year's Zeit, the trio's increased use of synthesizers and a growing affinity for space music resulted in albums that pushed the margin for the style. Atem, released in 1973, finally gained Tangerine Dream widespread attention outside Europe; influential British DJ John Peel named it his LP of the year, and the group signed a five-year contract with Richard Branson's Virgin Records. Though less than a year old, Virgin had already become a major player in the recording industry, thanks to the massive success of Mike Oldfield's Tubular Bells (widely known for its use in the film The Exorcist). Tangerine Dream's first album for Virgin, Phaedra, was an milestone not only for the group, but for instrumental music. Branson had allowed the group free rein at Virgin's Manor Studios, where they used Moog synthesizers and sequencers for the first time; the result was a relentless, trance-inducing barrage of rhythm and sound, an electronic update of the late-'60s and early-'70s classical minimalism embodied by Terry Riley. Though mainstream critics were unsurprisingly hostile toward the album (it obviously made no pretense to rock & roll in any form), Phaedra broke into the British Top 20 and earned Tangerine Dream a large global audience. The follow-ups Rubycon and the live Ricochet were also based on the blueprint with which Phaedra had been built, but the release of Stratosfear in 1976 saw the use of more organic instruments such as untreated piano and guitar; also, the group added vocals for 1978's Cyclone, a move that provoked much criticism from their fans. Both of these innovations didn't change the sound in a marked degree, however; their incorporation into rigid sequencer patterns continued to distance Tangerine Dream from the mainstream of contemporary instrumental music. Baumann left for a solo career in 1978 (later founding the Private Music label), and was replaced briefly by keyboard player Steve Jolliffe and then Johannes Schmoelling, another important member of Tangerine Dream who would stay until the mid-'80s. In 1980, the Froese/Franke/Schmoelling lineup was unveiled at the Palast der Republik in East Berlin, the first live performance by a Western group behind the Iron Curtain. Tangerine Dream also performed live on TV with the Munich Philharmonic Orchestra one year later, and premiered their studio work on 1980's Tangram. Mike Oldfield had shown the effectiveness of using new instrumental music forms as a bed for film on Tubular Bells, and in 1977 The Exorcist's director, William Friedkin, had tapped Tangerine Dream for soundtrack work on his film Sorcerer. By the time the new lineup stabilized in 1981, Hollywood was knocking on the band's door; Tangerine Dream worked on more than 30 film soundtracks during the 1980s, among them Risky Business, The Keep, Flashpoint, Firestarter, Vision Quest, and Legend. If the idea of stand-alone electronic music hadn't entered the minds of mainstream America before this time, the large success of these soundtracks (especially Risky Business) entrenched the idea and proved enormously influential to soundtrack composers from all fields. Despite all the jetting between Hollywood and Berlin, the group continued to record proper LPs and tour the world as well. Hyperborea, released in 1983, was their last album for Virgin, and a move to Zomba/Jive Records signaled several serious changes for the band during the late '80s. After the first Zomba release (a live concert recorded in Warsaw), 1985's Le Parc, marked the first time Tangerine Dream had flirted with sampling technology. The use of sampled material was an important decision to make for a group that had always investigated the philosophy of sound and music with much care, though Le Parc was a considerable success -- both fans and critics calling it their best LP in a decade. Tyger, released in 1987, featured more vocals than any previous Tangerine Dream LP, and many of the group's fans were quite dispirited in their disfavor. During the early 2000s, new material surfaced at a slightly slower rate. In addition to a handful of studio albums -- including 2005's Jeanne d'Arc, for which Froese was first joined by Thorsten Quaeschning, a musician who would figure into several subsequent TD releases -- and a couple soundtracks (Great Wall of China, Mota Atma), there was "the Dante trilogy" (Inferno, Purgatorio, and Paradiso, released from 2002 through 2006) and the five-part "atomic seasons" (with titles like Springtime in Nagasaki and Winter in Hiroshima, created for a Japanese man who survived the bombings of both cities). During these years, keeping tabs on archival releases, both live and studio, was more challenging than ever; most prominently, there was The Bootmoon Series, entailing audience and soundboard recordings of performances dating back to 1977, as well as reissues of the first four albums and several anthologies. Despite so much focus on the past, epitomized by 40th anniversary concerts that took place 2007, Tangerine Dream remained equally connected to the present. Tangerine Dream is a German electronic music group founded 1967 in West Berlin, Germany, by Edgar Froese. The band has undergone many personnel changes over the years, with Froese being the only continuous member. Drummer and composer Klaus Schulze was briefly a member of an early lineup, but the most stable version of the group, during their influential mid-1970s period, was as a keyboard trio with Froese, Christopher Franke, and Peter Baumann. Early in the 1980s, Johannes Schmoelling replaced Baumann, and this lineup, too, was stable and extremely productive. 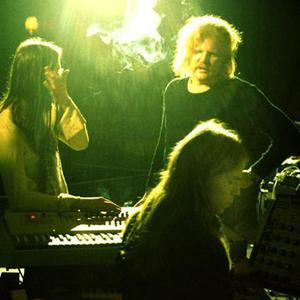 As of 2009, Tangerine Dream is comprised of Edgar Froese and Thorsten Quaeschning. For concerts and recordings they are joined mainly by Iris Camaa, Linda Spa and Bernhard Beibl. Tangerine Dream's early "Pink Years" albums had a pivotal role in the development of krautrock. Their "Virgin Years" and later albums became a defining influence in the genre known as new age music, although the band themselves dislike the term. Tangerine Dream's music was first featured in Sorcerer, a William Friedkin film, and later in the Tom Cruise movie, Risky Business. Their track, "Le Parc" was also featured on the TV Series, "Street Hawk."